Happy Taco Tuesday, friends!! As if Monday being over weren’t reason enough to rejoice, I also get to share another great taco recipe with you today! Don’t get me wrong, not every Monday is a terrible one, but let’s be honest…saying goodbye to the weekend and going back to work on Monday is rarely something any of us look forward to. Tuesday, however, has become a day that I look forward to very much. Almost as much as Friday. Almost. I mean, if I’ve survived Monday and I still have a ways to go until Friday, I need something to be excited about, right?? And here it is, folks. Thai beef tacos. Can we just say it together…. ooh! aah!! YUM! But really, when I saw this recipe, saw the marinade ingredients, I knew. I knew it had to be amazing. I made a few minor changes to the preparation, and let me just say (again), YUM. And I wrote it below in the directions, but I want to reiterate…make sure you marinate for at least the minimum suggested time. If you don’t…if you don’t read the recipe until 5 minutes before it’s time to start cooking and then don’t have time to marinate for 4 hours…you’ll wind up with some very lackluster, barely flavored beef. And ain’t nobody got time for that! So…my suggestion is to make up the marinade and stick it in the fridge the night before you want to make it. You’ll get the maximum flavor that way. Slicing the beef first also helps it to soak up the flavors better. Just sayin’. I gots a few tricks up my sleeve now and again. Trim your steak of any fat, slice into strips against the grain, and season with salt and pepper. Remove steak from fridge and let sit for 20-30 minutes to bring it to room temp. Meanwhile, in a medium bowl, combine the mango, shallot, and jalapeno, season with salt and pepper and set aside until ready to use. Heat a large skillet or grill pan over high heat. Spray with cooking spray or coat with 1 teaspoon of olive oil. Remove steak from marinade with kitchen tongs, letting excess liquid drip back into the marinade bowl (or bag), and place in the hot skillet. Sear the meat for about 1-2 minutes and then use the your tongs to flip the pieces and sear on the other side for another minute or so, until it has reached your desired doneness. I recommend somewhere between medium and medium-well so it doesn’t get tough or dried out. Remove skillet from heat and warm your tortillas. 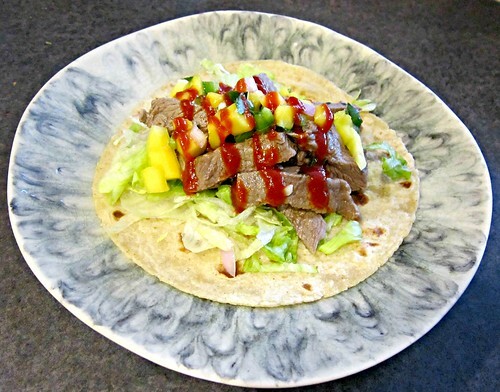 On each warmed tortilla, place 1/4 cup or so of shredded lettuce, then top with several strips of steak, a couple spoonfuls of the mango salsa, and a drizzle of Sriracha for some heat!